Add this shop to my favorites. 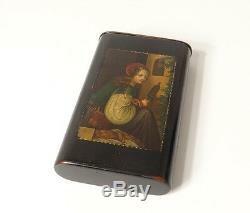 Very pretty box or Russian lacquered case, blackened wood painted a woman, signed, nineteenth time. Note some slight lack of paint and missing two screws, visible in the photos. Russian craftsmanship is deeply inspired by the sacred art of the icon. After the revolution of 1917, many of these artists had to "reconvert". They began to create miniatures on lacquer and lacquered boxes. There are four lacquered box production schools in Russia: palech, fedoskino, holoui and mstera (city names). The boxes to be painted are made of porous cardboard, pasted with paste and then dried. After being lacquered, they are then ready to be decorated by the artist. The latter will first paint the subject (s) and then apply the gilding. Finally, the work will be covered with 7 to 8 layers of lacquer and after prolonged drying, will be polished. These small boxes with various shapes are decorated with mythological scenes, Russian tales, scenes of everyday life, landscapes ... Dimensions: 13.4 cm by 8 cm thickness 2.5 cm. The item "box blackened wood case work Russian woman nineteenth time" is on sale since Thursday, November 17, 2016. It is in the category "art, antiques \ objects of the nineteenth and before". The seller is "antique-delaval" and is located at / in valves. This item can be delivered anywhere in the world.